Seriously. Has there ever been a gang that was slower on the trigger than the people on Revolution? There were so many moments during last night's midseason finale when I just wanted somebody to stop waving a gun around and actually pull the trigger. I know there's a bullet shortage due to the Blackout — but bullets aren't going to multiply if you hang on to them longer. 1) Miles has his old buddy Bass at gunpoint. It's fine that Miles wants to give a long speech to explain why he's going to shoot Bass, but that speech should then end with him actually shooting Bass, not letting his gun down to the point where Bass can attack him and turn this into a fistfight followed by a swordfight. (Because they both have swords in their pants. Awesome.) Have your emotional moment, shoot the guy, and move on. In both of those instances, it was a "yelling at the television set" level of character incompetence. Particularly when Rachel knows what'll happen if she leaves the pendant there, and that it'll be her fault. And Miles is supposed to be a strategic genius. Oh, and then there's the scene where Strausser has Charlie and Danny at gunpoint and is threatening to shoot one of them — and in that instance, I just wanted him to pull the trigger, to make the show automatically twice as watchable. Actually, like I said, last night's episode was one of the best thus far, because it developed the relationship between Miles and Bass, something we'd only glimpsed in a few episodes previously. Their backstory has been one of the most interesting things on the show from the beginning, and last night's episode fills in a lot of the gaps. In particular, we see them as little kids together, sketching the logo that eventually becomes the Monroe Republic's banner image. And then we see them two years before the blackout, when Monroe's whole family has been killed in a car accident and Bass is drinking at his family's graves, contemplating suicide — until Miles shows up and promises to be there for him. Then finally, there's a glimpse of the two of them, five years after the blackout, fighting in Trenton, NJ — Miles gets injured and Bass refuses to leave him, because Miles has always been there for Bass, and Bass would rather die than leave his best friend behind. When Bass finds out that Miles is back in Philadelphia, he refuses to run away as Tom Neville suggests. He also won't let Jeremy take some men and kill Miles for him, as Jeremy suggests. Instead, he faces Miles himself and asks Miles to come back and rejoin the Militia, with a full pardon — just as the hallucination of Monroe offered in last week's oxygen-deprived wacky vision episode. And Miles seems to consider it pretty seriously. The shoring up of the Miles-Monroe relationship is very welcome, since their former bond seems to be one of the main emotional axes this show spins on. 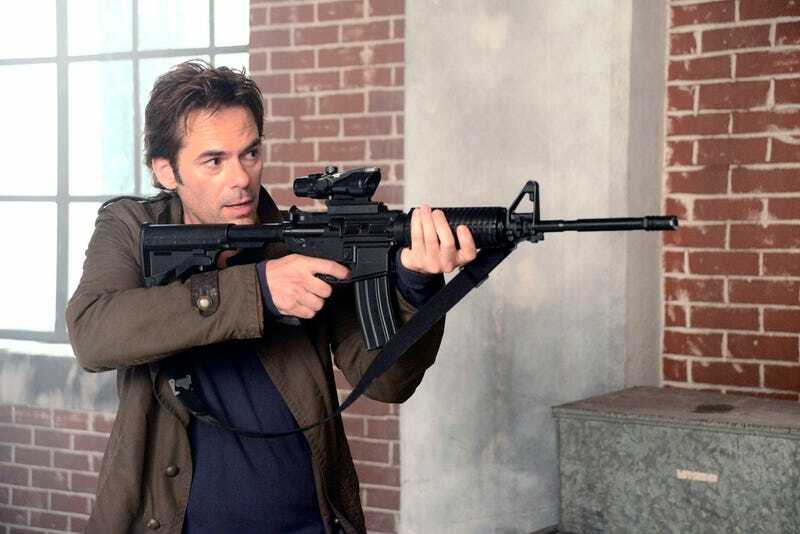 It helps that both Billy Burke and David Lyons are pretty decent actors, who can carry a scene of intense violent bromance together with a reasonable amount of aplomb. Oh, and Miles takes Tom Neville's wife hostage, in exchange for the return of Danny and Charlie — but he has to settle for Google and Nora instead. This earns him the eternal enmity of Tom Neville, who vows to kill him some day. Giancarlo Esposito completely owns this episode, just with the way he taunts Google for his former status as Wired Magazine coverboy, and the way his whole face pulses in agony when he says he has no choice but to help Miles, to save his wife. As it is, though, at least the stage is set for a new chapter next spring that will hopefully be more fun — nobody's a prisoner any more, Monroe is now fully committed to killing Miles, and he has modern weaponry against everybody else's crossbows and swords and stuff. Of course, the modern weaponry only helps if Monroe remembers what everybody else seems to forget on this show: when you get someone in your crosshairs, go ahead and pull the damn trigger.